Lake of the Ozarks Condo Staging is for the Serious Seller or Investor! Decorating is optional. Staging is Mandatory! Do you know the difference between Staging and Decorating? Staging is preparing a home for sale by de-personalizing it and making it appealing to potential buyers. Decorating is personalizing your home to your taste so that you will enjoy living there. Staged Condos appraise higher in most cases. Staging is the art of designing your condo to SELL or increase RENTAL ACTIVITY. Staging will highlight the best features of your home, establish focal points, and create spaces that buyers fall in love with! Staging produces that "WOW!" factor! The ultimate goal of Staging is to present your property at its very best...like a model home...so it sells quickly and for top dollar! And if you're an investor Staging should be the key to helping you see your return on investment much quicker! Condo Unit 123-3C had been on the market 430 days prior to redecorating. After staging within 48 hours seller received contract for sale. Great Job! That looks awesome! That was all I could say when I saw how Lynda had transformed my outdated condo into a modern relevant living unit. She took some contemporary furniture and provided all the appropriate accent pieces to make the space come alive again! I would highly recommend Lynda and turn the keys over to her if you are looking to upgrade your living space without breaking the bank. I am writing this recommendation letter on behalf of Lynda Brown. My family and I started looking for a condominium that we could live in down the road, but rent out in the meantime. The one condo that our kids said we couldn't buy is the "old lady" condo. It was so outdated that we had a hard time seeing past that. What it did offer, though, was a huge wrap-around deck and an awesome view. My husband and I decided that the deck and view was worth the shot. Living in Alaska, though, made it hard, if not impossible, for us to update. Lynda offered to help us bring it up-to-date. We told her our budget and went over together what changes we would like to make, what colors, theme, etc. She even arranged to be there when the cable company came to set up service and when Home Depot came to deliver our washer and dryer. Lynda made changes in every room of the condo. When we came down in June to stay in our condo for two weeks -- the kids knew we bought a condo, but we didn't tell them which one – they didn't even recognize the condo. We finally had to show them the original pictures of it before they believed that it was the same condo. That's how big of a change Lynda made in refreshing our condo. She turned our out-of-date condo, to a beautiful condo that felt warm and inviting to stay in. We highly recommend using Lynda if you are looking for a talented interior decorator that can update, refresh or decorate your condo. Complete staging in Master suite increased occupancy by replacing single queen with double queens. I first met Lynda Brown, about 8 years ago, when she was our property manager at Southwood Shores. I have made 2 corporate moves since purchasing the condo and moved from Missouri to Baltimore Maryland and then to Abingdon Virginia. During the time that I have worked with Lynda we have built a strong business relationship and I had come to rely on her a great deal since I was out of state. Because of a water leak in another residence, a great deal of my condo was water damaged and had to be gutted and replaced. Lynda was able to assist in setting up vendors for me and getting the help I needed in choosing paint and carpeting. She also helped with the selection and delivery of the new furniture. She did a superb job of decorating and selecting accent pieces that pulled the master suite together beautifully. 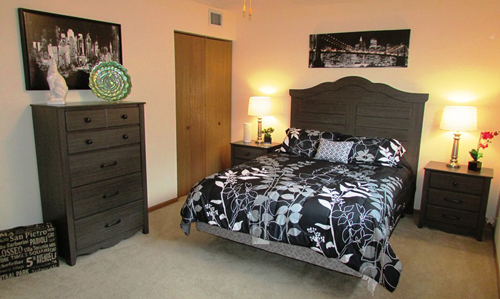 We received many compliments and recurring rentals as a result of Lynda's staging and decorating talents. I would highly recommend her as a staging and decorating specialist.